There were three parts to the course; the first focused on the laws and responsibilities surrounding health and safety in the workplace, the second focused on the difference between hazards and risks and how the hierarchy of control aims to control them, and the third was about the recording of injuries and incidents and how interactions in the workplace should be undertaken. Much of it seemed like common sense to me but a few of the things that were introduced to me work as tools for extending that common sense. It also explain to me the laws and procedures that are in place, which are important to know. I’ll give you a quick rundown of each section. The aim of workplace health & safety (WHS) laws are to make everyone involved in the workplace take care to make it safe. Employers, or whoever is running the workplace and/or is in charge of the workers, have a responsibility to provide a safe working environment and protection from any hazards to their workers. They must also make sure that workers understand the safe way to do things, and see that it is done that way. Hazards are things that could cause injury, while risk is the injury that could result. The hierarchy of control is a method for controlling risks. 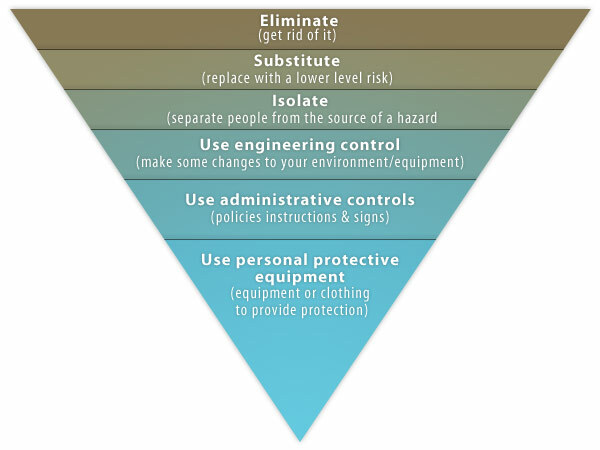 It ranges from eliminate the risk (most desirable) through to using personal protective equipment (least desirable). Workers are required to report all hazards as they arise, and fix them themselves if safely possible. If they can’t fix it, their employer should get them fixed as soon as possible. Harassment, bullying, discrimination, inappropriate drug and alcohol use, spreading gossip or malicious rumours, and initiations are all inappropriate behaviour for in the workplace, and should be reported if observed. Employers must consult with employees about anything relating to health & safety matters. Any incidents, work-related illnesses, dangerous events or near misses should all be reported. Injuries are reported by being recorded in the Register of Injury. Conflict can be dealt with in various ways, each of which suited to different situations. Other news from this week is that I got a new mobile phone; it’s a HTC Sensation which runs Android. I’m looking forward to the upgrade to Ice Cream Sandwich. When that happens, I might give you all a bit of a review of it. I’m finding it harder to find the time to blog than I thought I would, which is really quite frustrating. But I’m determined to keep up to my promise of one blog a week at the very least. I might be a bit more motivated if I knew anyone was out there, so if you’re reading this, drop me a line via the “Contact Me!” page above, and share the blog with your friends.